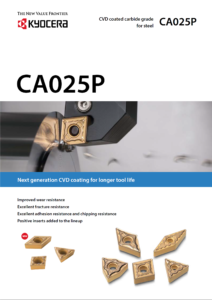 Kyocera Bring You the Latest CVD Coating for longer Tool Life and Improved Wear Resistance. Excellent Adhesion and Chipping Resistance. Thickened Alumina with Good Thermal Resistance Twice as Thick as Conventional Coating.